Delicious sauces and rubs. : Cookbook: 50 recipes. Classic American sauces and World's Barbecue sauces. How to make your boring food interesting? The solution is simple: sauces and rubs. Sauces and rubs take an important part in the development of most traditional cuisines around the world. But nothing tastes better than your own home-made sauce! 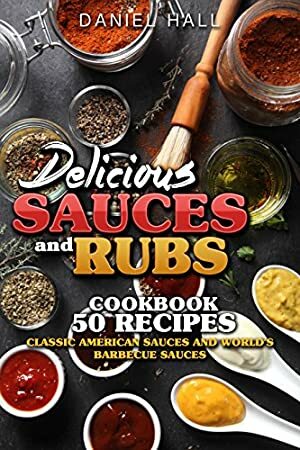 Looking for a delicious sauce and rubs recipes? We are totally convinced that sauces can brighten any dish. Just try it! Bring a sizzling, scorching, and exciting taste to your foods with fresh and hot sauces and rubs. And stop buying sauces in the market. Cook it in your kitchen! This cookbook is all about sauces and rubs. So get ready to take your breakfast or dinner to another level with your new tasty home-made sauces. Buy this cookbook now and discover the best classic, easy and delicious sauces and rubs recipes. It will become your all-time favorite cookbook. You can use our recipes every day as well as for your family holidays or friendly parties! Log In to track Daniel Hall on eReaderIQ. to be notified each time the price drops on any book by Daniel Hall. to stop tracking Daniel Hall. We started tracking this book on September 21, 2016. The price of this book has changed 57 times in the past 942 days. The lowest price to date was FREE last reached on April 16, 2019. This book has been FREE 28 times since we started tracking it. The highest price to date was $2.99 last reached on April 17, 2019. This book has been $2.99 27 times since we started tracking it.